← Will McLaren change its livery for start of the season? 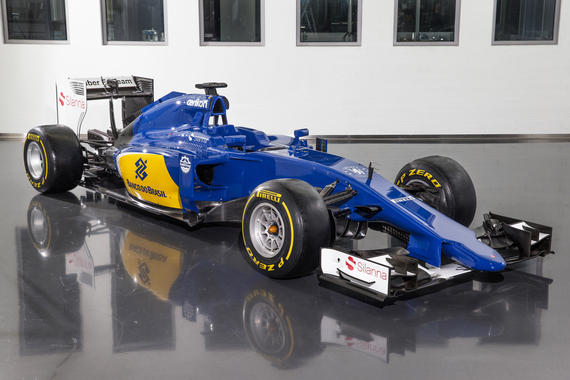 Sauber has unveiled its new C34, which will be driven this year by the new pairing of Marcus Ericsson and Felipe Nasr. As announced in November Nasr’s longtime sponsor, Banco do Brasil, features heavily in the new livery. Ericsson will drive the car at Jerez on Sunday. Sauber says that chief designer Eric Gandelin focussed on performance in slow corners, weight reduction and braking stability. 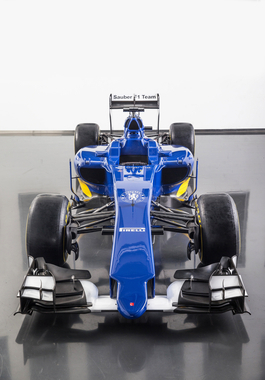 Outlining some of the key changes, the team said: “The sidepods of the new Sauber C34, are now slimmer than those of the Sauber C33, despite higher cooling requirements from the new power unit. This has been made possible by modifications to the attachment of the side crash elements. In addition, the architecture of the radiators, which are now positioned horizontally, has been fundamentally revised. “The engineers also paid great attention to the flexibility of the cooling system, which can be adapted precisely – and individually for the various components – to the ambient temperature and circuit characteristics. For example, small air vents on the side of the cockpit are only used in certain situations. Beyond this, the rear section as a whole is less voluminous, which benefits aerodynamic efficiency. “In terms of its concept, the engine is very much comparable with last year’s, but its architecture has changed significantly, necessitating numerous adjustments to the chassis. “The exhaust tailpipe is again positioned centrally between two pylons, though they are no longer supported by the rear crash element, but by the gearbox housing. Aaaiiieeeee! My eyes! My eyes! Dunno why your eyes are sore, there’s nothing to shock. It be… retro. Somewhat recalls the Schumy Mild Seven Benneton colors, although the blue here is darker. Like it.